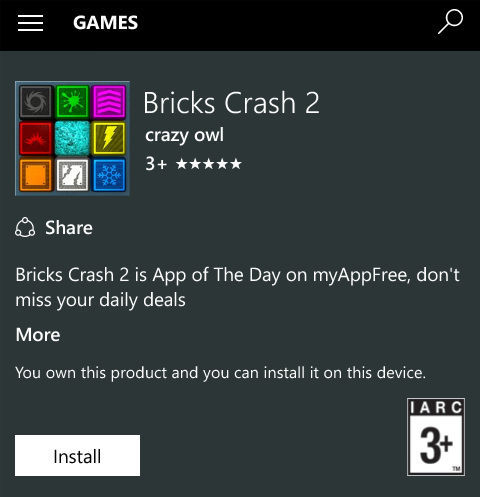 Windows Hive games Bricks Crash 2 is App of The Day on myAppFree. Bricks Crash 2 is App of The Day on myAppFree. Your goal is to clear all bricks from the board, scoring as many points as possible. You must shoot at them with balls of same color. Point your finger to where you want the next balls to go. ✔ Fantastic graphics and effects! ✔ 60 challenging puzzle levels! ✔ 2 game modes: puzzle and endless! ✔ 10 types of bricks! ✔ Clever saving system. So you can continue from the point where the finished, even if you are out of the game!